Shaela is my Administrative Assistant, soul sister, and cherished friend who has supported me throughout my transition of Mark’s passing. Sheala’s many talents include creating the magnificent Art you see throughout my Blog. She also takes care of all our tech stuff; manages my Facebook and website; runs my eBay page; empowers my Twitter (which I’m still learning); and instantly helps me with all things computer. Her applied skills in these areas free me to focus on communicating with the vast numbers of survivors and PTSDed military we hear from each day seeking to reclaim control over their own minds and lives just as I did. Shaela shares my love of animals and nature, often taking spontaneous, peace-inspiring walks with pets and me. She is extremely creative in clothes design and visual art images; thinks and behaves like an entrepreneur; can fix anything around the house with power tools and duct tape; offers precision security; and brings joy to every day. It is no wonder her Art is so profound! Enjoy! Cathy and I were 100% fulfilled in our life together when Shaela entered our lives. 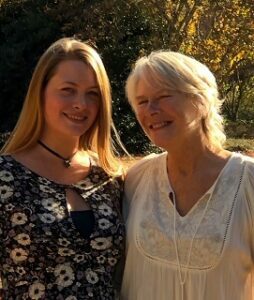 As a spook who always works anonymously, it was difficult for me to even consider Cathy’s request to welcome Shaela into the ‘mother-in-law quarters’ of our southern home. I had rescued Cathy and taught her how to heal herself from trauma, and she in turn was passing this information on to Shaela. Once Shaela applied the techniques that I had taught Cathy, which are detailed in PTSD: Time to Heal, I began to see what Cathy had seen in Shaela all along. Even more beautiful on the inside as she is physically, Shaela began merging into the complex life Cathy and I live as US Government Whistleblowers, making herself an asset I never could have foreseen we needed. With the political power in the US changing hands away from the Shadow Government, our workload is rapidly increasing. Shaela, now officially our Administrative Assistant, has made herself invaluable to our efforts and is a help to us on all fronts. A fiercely independent entrepreneur with her own successful online business, Shaela also runs our bustling book business with Cathy, leaving me free to do what I do. Shaela is a huge asset who can be highly successful at anything she chooses to do, and I am grateful to her for choosing to be a powerful part of our team! Thank you, Cathy, for having had eyes to see her unbelievable potential all along. Shaela is our Administrative Assistant, whose own personal background has opened her up to deep compassion and understanding of those striving to overcome PTSD and oppression. Shaela brilliantly and efficiently manages our business details, while Mark and I focus on meeting the rapidly increasing global demand for truth on mind control and healing from it. Shaela’s business savvy, tech capabilities, and creative entrepreneurship are balanced with her soulful grace and thoughtfulness. Always ready with humor to balance intensity, Shaela lightens our workload and paves the way to new horizons. Life’s synchronicity is profound, and we are deeply grateful for Shaela’s harmonious and energetic assistance during these exciting times. Thank you, Shaela, for being such an integral part of our lives and my cherished forever-friend! I moved into the mother-in-law quarters of Mark and Cathy’s restored home when I was 19 for help in healing both my mind and body. In personally applying the techniques laid out in Cathy’s book PTSD: Time To Heal I have been able to heal and use my brain in ways I never considered possible. This in turn inspired me to make a positive difference in the best way – through logical/legal action. Over time I began taking on responsibilities regarding Mark and Cathy’s effort – which is soul satisfying during these shifting times and positive worldly changes. I will personally be grateful to Mark and Cathy for the rest of my life for this highly educational, action applicable opportunity, and insight into the shadow world of intelligence. To those who know me, I’m a very private person by choice and will continue to stay as such in spite of other’s efforts to change this. Wishing the same fulfillment and inspiration I’ve experienced to all seeking truth and justice.